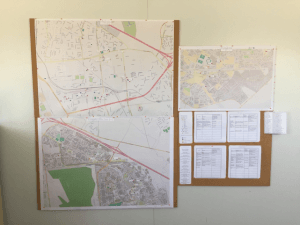 Throughout the previous weeks, we had made a major stride towards firmly connecting our map to the technology trainings by limiting the scope of the map to technology access points. These access points consist of libraries and Internet cafes. This focus allowed us to create the map we had been planning for and create a useful tool for the women in the program to increase their access to computers after we leave. 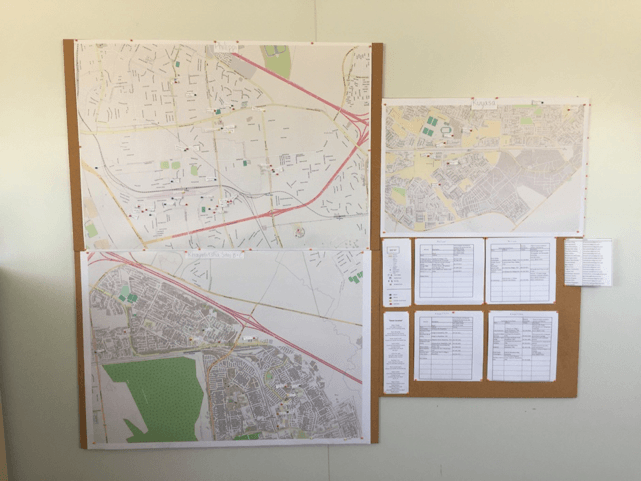 This idea also helped us to determine the exact scope of our map so that it would cover the entire area that women in the group lived, which included Philippi, Khayelitsha Sites B and C, and Kuyasa. Our original thoughts about how to connect the technology skills practice with the map was through using specific applications, such as Google and Google Maps, to complete different parts of the map, but we had yet to make this idea a reality. We had introduced the idea of mapping technology access points to the teachers earlier in the week to get ready for the large group mapping session. Dube was very interested in the map and figuring out where specific landmarks were for her personal understanding. Sylvia was particularly good at translating the route she knows walking around the community into finding things on the map. As we went through marking some initial landmarks before the large group saw the maps, it was very clear that this method would be both extremely efficient in finding things on the map, as well as help to get the women fully engaged in the map. Because the women hadn’t visited many of the assets before, it was taking a lot of time to use all of the resources necessary to find these access points. It was decided that mapping with the whole large group would both give us more time to get all of the points we wanted on the map, as well as provide more eyes for finding the points. How interested will the pilot trainees be in developing the map? How familiar will they be with technology access point in their areas? Will they see the value of the map as a way to help them access technology? Our first day of mapping went well with Brendan sitting with the Philippi map on his lap surrounded by our Mamas as they pinned where their houses were. It was immediately evident that the container was not the ideal place to work on the maps due to the area restriction. With this in mind, our next day mapping was spent out on the lawn in front of Sizakuyenza with the three maps spread out side by side and all the women circled around them. Before we could begin mapping the technology access points, we first had to put on some landmarks so that everyone could visualize what area it covered. We began with the map of Philippi and started by looking for a clinic. In the process of finding the clinic there were several landmarks mentioned along the way, such as the Police Station, Beautiful Gate, and the library. We marked these new landmarks along the way, which helped the group connect what they usually see in their communities with the area the map covered. As more landmarks were pinned, the group became more engaged and excited, and wanted to keep adding more. Soon, the WPI team only needed to do was write out the tags for the pins. After they felt as though they had exhausted the map of Philippi they moved to the Khayelitsha Site B and C and Kuyasa maps; finding landmarks on these maps proved challenging because fewer of the women were familiar with the area. When all the maps contained at least the bigger landmarks and locations of known libraries, we moved on to using Google Maps and the pins in a joint effort to mark where the unfamiliar libraries and new Internet access points were. 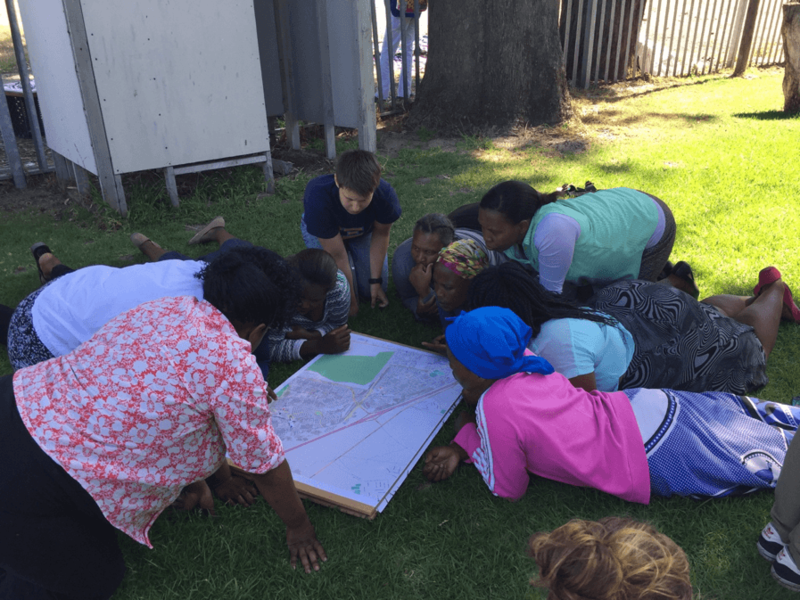 At first there was a little bit of a refresher of how to use Google Maps given by Dube and Thembisa, but quickly the group of women were searching Khayelitsha on their own. It was at this point that we took a step back again. Sitting off to the side of the group provided a new vantage point of looking from the outside in at this session and the program as a whole. Seeing the women create the map on their own using their knowledge of the community and the resources available to them online helped the women add most of the assets we had previously identified by the end of the day. While this was by no means our most moving or perspective-shifting experience with our Mamas, it was a very important day in finally developing the map that we had been waiting so long to see come together. Sitting on the side of the group as Dube and Thembisa instructed the others on how to use google maps to find libraries gave us a glimpse at what is possible for the future of the program. Although not every member of the group was engaged in this teaching session, whether due to lack of available computers or interest, there was still insight given from others about locations of streets on the physical maps. Seeing the interest in the map develop as the women became more familiar with it showed that the map will likely be used after we leave. It was our hope that through slowly seeing that these access points were available, they would consider starting to use them. We often found in the computer trainings that giving them tasks without any sort of framework led to less retention of knowledge, so it’s possible that the women saw the map making as just another task that we assigned them. However, the fact that the women took so much initiative with the map and started to pin both landmarks and access points by themselves implies that they saw the map’s value. We tried to stress the purpose of the map’s pins throughout, but as usual, there is always a chance that our point was not well communicated. Because of this, we have to rely on the continued communication of the point by Sbu, Vuyiswa, and others who we worked with and who have contact with the group to remind them why they made the map and encourage them to use it. One thing we know for sure will motivate the women to use the map after we leave is their desire to use computers. While this desire was strong even before we came, we have seen it grow as they learn new things. This drive will hopefully be able to motivate them to work through any confusion they still have about the map and hesitance to visit these access points and use the skills they have learned. Although they were not able to find as many access points as they might have been able to with more time, it was important that the time spent on the map was distributed the way it was so that the women had the greatest amount of time to pin landmarks and explore the options on their own to make the map theirs and develop interest in the project. Leaving room for the map to grow allows the women to make this even more their project after we leave and gives future tech training groups a chance to leave their own mark on the map. The hardest part about creating this map and evaluating its success is that because finding the right map took so long, there isn’t time for us to see how helpful it actually is for the women. Ideally, we would have been able to see if the women actually use the map and, based on why they did or did not, find ways to improve the map. While it would have been nice to have more time, the map that we ended up with benefitted the project and, we hope, the Women’s Networking Group, making the time spent learning about our co-researchers and the community for this map well worth it.